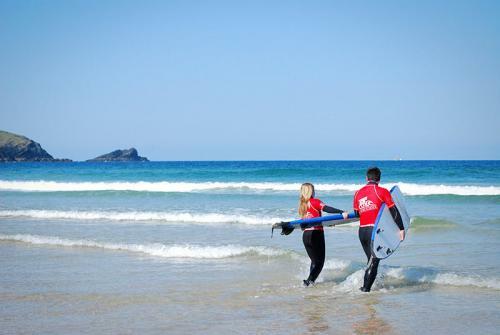 Taster Surfing Lessons in Newquay, Cornwall. Give surfing a go! Learn to surf with the Rip Curl English Surf School in Cornwall and have an absolute blast in the water! Our Taster Surfing Lessons cover the basics from beach safety to your first ‘pop-up’ and offer a fun introduction to this well-loved sport. You’ll see quick results and be buzzing for the rest of the day. We have an enthusiastic and encouraging team of International Surfing Association qualified instructors who are so passionate about this super-cool sport that they’ll go the extra mile to ensure you have an unforgettable surfing lesson and leave bitten by the surfing bug. You’ll enjoy unrivalled 1:8 ratio close quarter tuition, and be issued with a top of the range, warm and comfortable Rip Curl wetsuit and a Swell foam surfboard – the perfect beginners’ board. Made of thick foam there is no chance of injury and their greater surface area makes them the most stable platform on which to learn to surf. The Rip Curl English Surf School is located right in the heart of the action, overlooking Newquay’s famous Fistral surfing Beach. We’ll all suit up in our heated changing rooms, where you can also store your clothes and valuables, before hitting the surfing lesson just a stone’s throw away. Surfing in the UK really doesn’t get any easier than this! Should the waves not deliver at Fistral, we’re just a 10-minute walk from Newquay’s Towan beach that offers perfect waves for beginners. We’ll never throw you in at the deep end or in unsuitable conditions (it’s meant to be fun remember) – We’ve always got your back, and that’s a promise! British Team Coach Rob Barber and former British Surfing champion Johnny Fryer have carefully designed the Taster lesson toward first timers making real progression, as opposed to surf ‘shepherding’. Coaching in accordance to iambands, an internationally recognised surfing ability scale (equivalent to coloured Judo belts), we guarantee the highest level of tuition in the industry. With surfing recently becoming an official Olympic sport, there really is no better time to give this awesome, life changing sport a go. So call and book your Taster Surfing Lessons today, and who knows it could be you on the podium in Tokyo 2020. Call to check availability and book your Taster Surfing Lessons today.